This online application is designed as a wall calculator for cost and materials. Also, the app is proper for retaining wall estimation. By this program, you can make a rough estimation of a needed amount of finishing and facing materials to be used for the construction and insulation of external walls by calculating of the area and square. F — Side wall ridge height. total cost of building a wall. One of the possible ways of walls construction is bricklaying. It is one of those skills, which can be acquainted fast and easily. Thus this program can be used as brick wall calculator. Before you give a start to your project, you may get some experience in bricklaying while building a garden wall. In the process, you will definitely learn how to set the necessary footing, mix the mortar, keeping the level and use tools for finishing the joints. If you are keen on tackling your project, you may be looking for the best cost-effective construction way. It is quite understandable. The better preparatory work will allow you to decrease the number of possible mistakes. If there is a need to build up structural wall, it is more advisable to contact a professional builder. The program is intended to calculate the amount of the construction materials for the frame, wooden, block-built structures. You have to select the type of a structure, indicate the pediment ridge height. 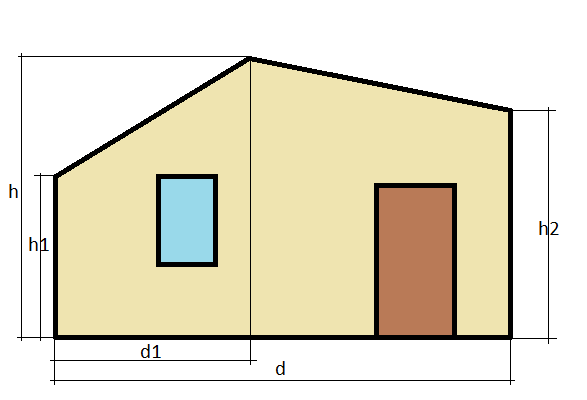 If the calculations are carried out for one-storeyed house, the walls height equals the pediment ridge height. The same procedure is to be followed if there is a sloping roof. It is worthwhile to draw your attention to the estimation of the amount and expenditure of redbricks. The app will make all necessary preparatory work before purchasing. Bought materials should include some small additional stock to avoid the shortage of it already in the process. When you know a preliminary needed amount, you will never buy too much, so no additional transportation of an excess amount is requested. Having the info about the required quantity, you can easily determine the expenses you will make for walling. If you approach an experienced bricklayer or tradesman, you will certainly avoid many commonly occurring mistakes. Another function of the app is concrete block wall calculator. When you want to construct a block-built structure, the calculation of what materials and approximate quantity of them will reduce the potential risks of material and financial losses. Moreover, it will help to develop more detail and actual budget for the construction. Usually to build this kind of walls is not time-consuming. This material also has good heat retaining properties. In addition, it needs the establishment of footing, because even a small wall requires a good foundation. The required size of the footing is a double size of a unit. The dimensions of the trench you have to gig for the footing depends on the size of the wall and future loads. If you have decided to build a wooden or Finnish-style house, sauna or another wooden structure then the estimation of the timber amount finally can play a critical part. Here we are not talking about saving or optimization of the funds available, but more about an environmental issue and deforestation. The price should be indicated per a cubic meter.